Single Jewish women (and their mothers) are supposed to experience a Pavlovian drool reaction to the presence of doctors, but I never went thusly gaga, not even for television doctors. And while I do admit that Clooney was cute, this whole “Grey’s Anatomy” McDreamy nonsense over the admittedly adorable Patrick Dempsey wasn’t a reason for me to watch. I already had “ER,” so my triage rooms were all occupied. And what kind of hospital in a major city doesn’t seem to have any Jewish doctors, anyway? But friends I trusted loved “Grey’s Anatomy”–so I gave it a whirl. The format–young doctors dodging barbs from demanding residents and struggling to make it in a hospital–was familiar from other television shows, but the characters are innovative enough to keem me coming back, with each episode peeling back a layer of complexity for the residents of Seattle Grace. In last night’s episode, the first of Season 3, Izzy–devastated by the death of her heart-transplant patient turned love-of-her-life Denny–lay prostrate on the floor of her bathroom as her friends stood outside and debated who should attempt the impossible task of consoling her. Meredith was making sandwiches, because it’s what you do when people die. 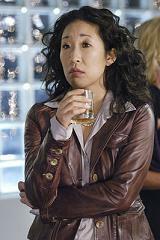 “You mean like shiva,” asks Christina Yang (Sandra Oh). What? Yang reveals that her family is Jewish, so they sit shiva. “Tell me about shiva,” says Izzy from her prone position on the bathroom floor, engaging in conversation for the first time since her fiancee/patient passed away. “It’s supposed to help with your grieving,” said Yang, explaining that they sat shiva for her grandmother for seven days, offering a detailed–and accurate–description of the traditions of this seven-day Jewish mourning period. This marks my first awareness that Yang is Jewish, and I wonder what kind of impact that added layer will have on her character’s story arcs over the course of the upcoming season. An hour and a channel flip later, I’m watching “ER,” where Estelle Harris (who will forever be known to many as “George Costanza’s mother”) shows up as the mother of the burly reception manager Jerry Markovic (Abraham Benrubi, who’s been with the show on and off since 1994) and starts talking at him with “oy veys” and calling him “sheyneh punim” (beautiful face). So suddenly, another Jewish character is outed on a medical drama–this time by his loud, abrasive cliche of a Yiddishism-spitting Jewish mother. I found myself again wishing for TiVo, so I could rewatch those scenes for intimations of future plotlines, how Jewish tradition might impact story and character development. But most often, a Jewish television character is just Jewish culturally, making the perfunctory remark about how he or she observes Hanukkah, not Christmas, right before joining in the caroling chorus. And unless there’s a Jewish patient, or until Hanukkah rolls round again, we forget that the distinction was even made. On “ER,” it’s unlikely that Jerry’s religion will become a storyline, but on “Grey’s,” it has a chance–the show never misses an opportunity to raise the stakes for each character, adding layers of complexity and nuance in characters as distinct from one another as they are interdependent and complementary.